At UNC Asheville, sustainability is about more than recycling (although we do that, too). We have a vibrant sustainability culture that welcomes student, staff, faculty and community involvement. From our classes to our student organizations, our campus facilities to our beautiful edible gardens, UNC Asheville offers a wide range of opportunities for exploring and enhancing our relationship with the planet and its living systems. 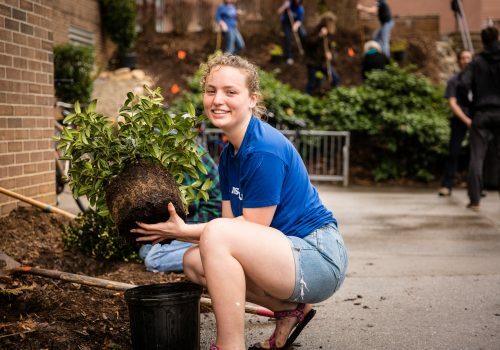 Sustainability is also a core value of UNC Asheville’s strategic plan, which solidifies our commitment to educating students about all dimensions of sustainability by integrating environmental literacy throughout the curriculum and modeling sustainable campus practices. Every day we are reaching thousands of individuals in classrooms, offices, labs, residence halls, dining areas, restrooms, and open spaces to engage them in co-creating a vibrant and sustainable future for UNC Asheville. Your involvement can significantly enhance our natural environment, human communities, and the financial health of our institution. Got an idea to share or a question about our campus? Just email sustain@unca.edu.